Charlotte Brontë’s spirit lives on, with those of her sisters and brother, on Haworth Moors, which are at their wildest and most atmospheric in winter and the inspiration for so much of the Brontës’ work. Heading out west from the pub, past Lower Laithe Reservoir and then back through Stanbury to the Museum Parsonage, you will pass, on the return, the Brontë Waterfall described by Charlotte as a “perfect torrent racing over the rocks, white and beautiful”. This is the first book that I remember reading as a child and I remember being carried away with the romanticism of it all. I was about 13 when I read it and it blew my head off. I would still lift it up and read it and it takes me right back to that age and the first stirrings of romantic love. Jane Eyre. In Charlotte Brontë's most famous novel, a young governess falls in love with her employer, only to find that he harbors a dark secret — a wife he keeps locked in the attic. The UK-China cultural exchange was another theme of the night. Bradford, the UNESCO City of Film, and the British Library came together to reveal China's long-standing affection for the works of the Brontë sisters and the growing relationship between British and Chinese films. Rompió con los esquemas de la época a base de fortaleza y valentía, y se convirtió en poco tiempo en uno de los grandes clásicos de la literatura. Jane Eyre, la obra de Charlotte Brontë, toma un nuevo formato estos días con la pieza que produce el Teatre Lliure. Dirigida por Carme Portaceli, y con Ariadna Gil como protagonista, la historia llegará la próxima semana al teatro Rosalía, donde estará el 8 y 9 de febrero a partir de las 20.30 horas. Alicia Pardo: Enfrentarse a un clásico de tanto calado como este, ¿inspira más respeto? A.G.: ¿Sabes lo que pasa? Yo no había leído la novela, con lo cual no tenía ese peso que hubiera tenido alguien para el que es una de sus referencias. Había visto alguna adaptación del libro al cine y había leído cosas de Emily Brontë, pero no de Charlotte. Así que fue como un descubrimiento. El personaje me interesó desde el primer momento. A.P. : Le llegan muchos como Eyre, que arrastran experiencias duras, ¿le han encajado en ese registro atormentado? Some other things around: Valentine memes on Your Tango, including Wuthering Heights quotes. Popular baby names including Jane on Babygaga. A Charlotte Brontë joke in The Clarion Herald. Archive of Our Own posts a new fan fiction Jane Eyre story: My Antoinette. Philip Hamlyn Williams posts about William Smith Williams and Art. The Dirty Club of Books (in Italian) reviews a new Italian translation of Mary Taylor's Miss Miles. 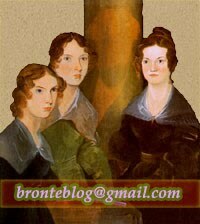 The Eyre Guide posts a list of the worst adaptation choices in Jane Eyre movies and TV series.